Members of the Senate Judiciary Committee left Tuesday's hearing on the Trump administration's family separation policy and efforts to reunify children with their parents at the border with more questions than firm answers from top immigration officials across the federal government. Officials from U.S. Immigration and Customs Enforcement, the Border Patrol and Health and Human Services were pressed on just how the administration's policy has been implemented and what problems still occur amid bipartisan outcry over the practice of detaining young children at migrant facilities away from their parents currently being prosecuted for entering the U.S. illegally. While many of the officials testifying on Tuesday pressed the senators to find a legislative fix to outstanding immigration issues, at no point were the witnesses able to clearly define what went wrong or if the administration's policies were deemed a success. Officials were at many times unable to provide updated and exact numbers of those that have been reunified as a result of court-ordered deadlines for the administration as well as those children still without the care of their parents. During one point of questioning, HHS' Commander Jonathan White went so far as to explain that in the early deliberative process of rolling out the administration's policy, he personally raised a "number of concerns" within HHS' Office of Refugee Resettlement (ORR) program about the impacts of the policy. He told lawmakers that his office raised the issue of trauma to children as a result of policy to administration officials, saying that the separation of children from parents entails "significant risk of harm to children" as well as "psychological injury." 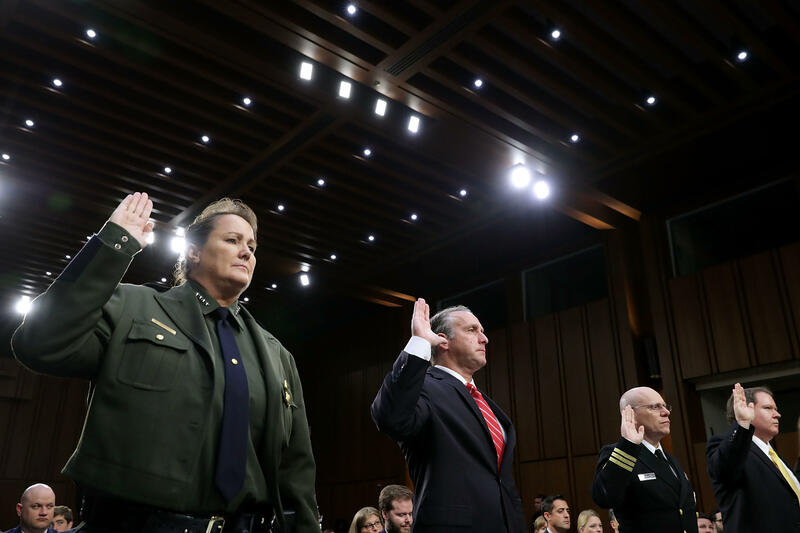 The hearing was also a moment for lawmakers to press immigration officials on reports of sexual and other abuse of immigrants at government detention facilities. ICE's Matthew Albence described an existing oversight process at detention facilities that involved reporting any cases of misconduct, but went on to compare family residential centers as "summer camps" for children. Acting Chief Carla L. Provost of the U.S. Border Patrol meanwhile said, "We do not leave our humanity behind when we report for duty." While Chairman Grassley criticized the administration's family separation family, saying it "ought to be revised immediately" he said that Congress has failed to take a "simple step that could have prevented the family separations we now decry." He demanded that the decades old Flores v Reno case, which in 1997 led to national standards for facilities holding migrant children, be repealed as a first step in that process toward immigration reform. He said it would be the "best way to ensure this crisis doesn't happen again." Grasley says members of Congress "ought to be disturbed" by the allegations of sexual abuse at detention facilities along the border. He said such reports of abuse are "unnacceptable and the American epople expect better." He noted, however, that the issue isn't new, saying that some of the cases of abuse date back to at least 2012 with more troubling cases occuring in 2015 and 2016. He said it presents a "larger systemic issue that needs to be addressed." Grassley added, "no one no matter their immigration status should have to suffer such abuse." ICE's Matthew Albence said that detention facilities regularly undergo a "very rigorous inspection process and oversight process" and that any allegations of abuse or wrongdoing in any detention facility is automatically reported to appropriate resources. He went on to describe family residential centers, FRC's, as being comparable to "summer camps", saying children have access to food, water, educational opportunities and outside time. He says he's "very comfortable" with immigrants' treatment. Pressed later by Sen. Mazie Hirono, D-Hawaii, if he would be willing to send his own child to such a facility he deemed a camp, he said she was "missing the point" and that individuals were in such facilities "because they have broken the law." Acting Chief Carla L. Provost of the U.S. Border Patrol meanwhile said, "We do not leave our humanity behind when we report for duty." Ranking Member Feinstein said that lawmakers have a "constitutional and moral obligation to intervene" in the border separation crisis, and as a result, raised a narrow bill that she, along with several Republican colleagues, have proposed in the Senate. The bill would "prohibit the separation of children, require ongoing reporting by the administration and public reporting about what has occurred." Feinstein adds that the bill would also provide "additional judges, lawyers and resources to ensure families are treated humanely and not left ignored in facilities without proper sanitation conditions." She said that she was "hopeful" lawmakers were close to an agreement and that the limited bill could enjoy broad bipartisan support. Albence appeared to suggest that while DHS and ICE handle the legal aspects of family separation, it's incumbent upon Congress to find a "permanent fix" to outstanding immigration issues in order to provide "operational clarity for officers in the field." "Congress must act to eliminate the loopholes that incentivize illegal immigration, and must also provide ICE with the lawful authority and requisite funding needed to ensure that families can be kept together throughout the course of their immigration proceedings," Albence urged. He added that under existing policies, it would be "impossible" to wrap up immigration proceedings in 20 days thus presenting border authorities to have "no choice" but to release individuals that arrive with children back into the community, a process the Trump administration has dubbed s "catch and release." Provost meanwhile said that the issue of separating children from parents is not "unique" to the Trump administration alone, adding that CBP has prosecuted adults who have come into the U.S. illegally in prior administrations. Provost noted, however, in her opening remarks "action taken by lawmakers, the judiciary, policymakers and operators—while made in good faith by people grappling with complex issues—can have unintended consequences on the functioning of the immigration system as a whole." "Consistent application of clear immigration laws enables access to the system's resources by those legitimately seeking its benefits while diminishing chaos on our border sought by transnational criminal organizations," said Provost. Sen. John Cornyn, R-Texas, raised a common refrain for liberal Democrats as of late -- the proposal to abolish ICE altogether amid ongoing concern over family separation. Albence told lawmakers that such a suggestion would cause "huge" impacts on public safety, let alone immigration at southern border. He argued that the country could not have strong border security without such a void in the enforcement arm of ICE. All witnesses, with the exception of HHS' Commander Jonathan White, were unable to clearly explain what went wrong in process of the administration's family separation policy when pressed by Sen. Sheldon Whitehouse, D-Rhode Island. All witnesses cited longstanding policies and processes without explicitly acknowledging that there were any flaws in carrying out the policy, despite clear cases of difficulties in tracking down familial connections between separated children at the border. But at one point when asked by Sen. Richard Blumenthal, D-Connecticut, for the witnesses to raise their hands if they felt the administration's family separation or zero toleranace policy was a success, not one witness raised their hands. White testified however, that in the early deliberative process of rolling out the administration's policy, he personally raised a "number of concerns" within HHS' Office of Refugee Resettlement (ORR) program about the impacts of the policy. He told lawmakers that his office raised the issue of trauma to children as a result of policy to administration officials, saying that the separation of children from parents entails "significant risk of harm to children" as well as "psychological injury." "It my heartfelt conviction that we must reunify these children with their parents," White urged.